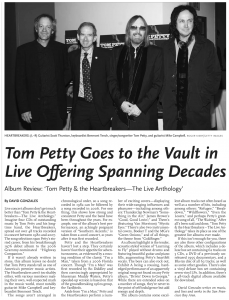 Album Review: "Tom Petty & The Heartbreakers -- The Live Anthology"
Live concert albums don't get much better than "Tom Petty & the Heartbreakers -- The Live Anthology." Imagine four CDs of outstanding music by Tom Petty and his longtime band, the Heartbreakers, spread out over 48 tracks recorded in concert between 1980 and 2007. The song selections span Petty's storied career, from his breakthrough 1976 debut album to the 2006 Grammy-nominated "Highway Companion." If it wasn't already written in stone, this album leaves no doubt that Tom Petty stands tall as one of America's premier music artists. The Heartbreakers aren't too shabby either, with various members making their own, well-respected mark in the music world, most notably guitarist Mike Campbell and keyboardist Benmont Tench. The songs aren't arranged in chronological order, so a song recorded in 1982 can be followed by a song recorded in 2006. For one thing, this shows how strong and consistent Petty and the band have been throughout the years. For example, one of the album's best performances, an achingly poignant version of "Southern Accents," is taken from a 2006 concert, 21 years after it was first recorded. Petty and the Heartbreakers haven't lost a step. They certainly haven't lost their appetite for adventurousness, as evidenced by a rousing rendition of the classic "I'm a Man," taken from a 2006 Florida concert. Though "I'm a Man" was first recorded by Bo Diddley and then convincingly appropriated by bluesman Muddy Waters, Petty's speeded-up version is based on that of the groundbreaking 1960s group, the Yardbirds. Aside from "I'm a Man," Petty and the Heartbreakers perform a number of exciting covers -- displaying their wide-ranging influences and pleasures -- including among others: Thunderclap Newman's "Something in the Air;" Jame Brown's "Good, Good Lovin'," and Them's (featuring Van Morrison) "Mystic Eyes." There's also two instrumental covers, Booker T and the MGs's "Green Onions," and of all things, the theme from "Goldfinger." An album highlight is the tender, acoustic-styled version of "Learning to Fly" played without drums and featuring beautiful guitar and piano fills, augmenting Petty's heartfelt vocals. The boys can also rock out, Exhibit A being a rousing, hard-edged performance of an apparently original song not found on any Petty album, "Drivin' Down to Georgia." While there are extended solos on a number of songs, they're never to the point of self-indulgence but add energy and depth. 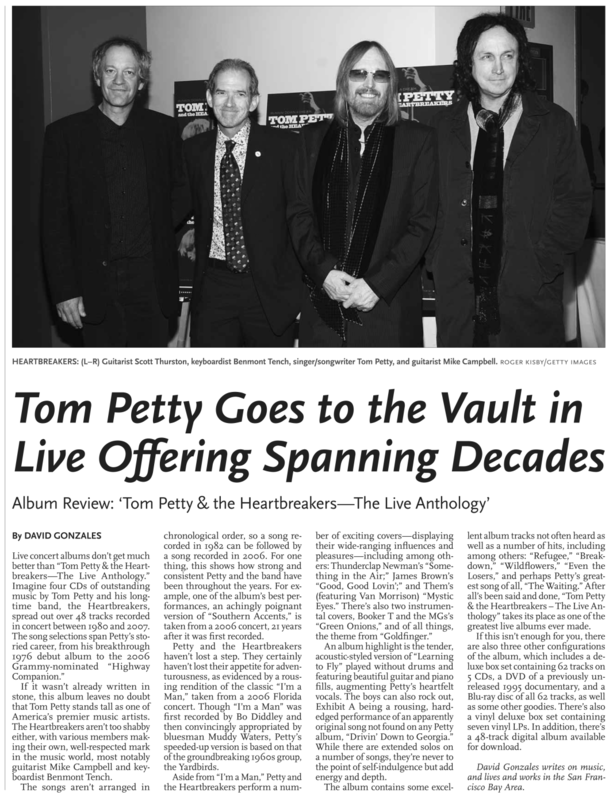 The album contains some excellent album tracks not often heard as well as a number of hits, including among others: "Refugee," "Breakdown," "Wildflowers," "Even the Losers," and perhaps Petty's greatest song of all, "The Waiting." After all's been said and done, "Tom Petty & The Heartbreakers -- The Live Anthology" takes its place as one of the greatest live albums ever made. If this isn't enough for you, there are also three other configurations of the album, which includes a deluxe box set containing 62 tracks on 5 CDs, a DVD of a previously unreleased 1995 documentary, and a Blu-ray disc of all 62 tracks, as well as some other goodies. There's also a vinyl deluxe box set containing seven vinyl LPs. There's also a vinyl deluxe box set containing seven vinyl LPs. In addition, there's a 48-track digital album available for download.